Scion Ignition Parts. Aftermarket Performance Ignition Upgrades for Scion FRS, tC, xA & xB. Choose from Performance Ignition Coils, Spark Plugs and Ignition Equalizer Kits by NGK, Denso, Okada Projects, NRG Innovations & Weapon R.
04-06 Scion xA Ignition Parts. 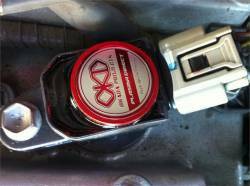 Aftermarket Ignition Upgrades for Scion xA. Choose from Performance Coils, Iridium Spark Plugs & Ignition Equalizer Kits. Increase your spark output for increased power and fuel efficiency in your xA. 04-06 Scion xB Ignition Parts. Aftermarket Ignition Upgrades for Scion xB. Choose from Performance Coils, Iridium Spark Plugs & Ignition Equalizer Kits. Increase your spark output for increased power and fuel efficiency in your xB. 08+ Scion xB Ignition Parts. Ignition Upgrades for Scion xB2. Choose from Iridium Spark Plugs by NGK & Denso, as well as Performance Ignition Coils by Okada Projects. Increase your Spark Output by 400% for optimum power and efficiency.